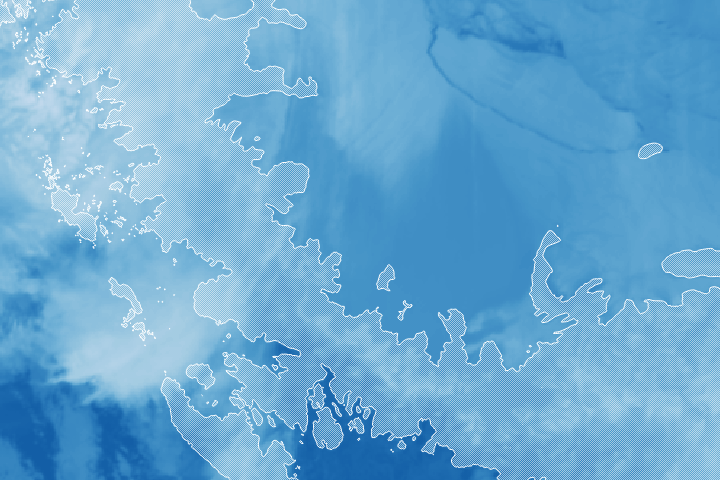 NASA’s Operation IceBridge—the airborne mission flown annually over both polar regions to map the ice—is now in its ninth year making flights over Antarctica. 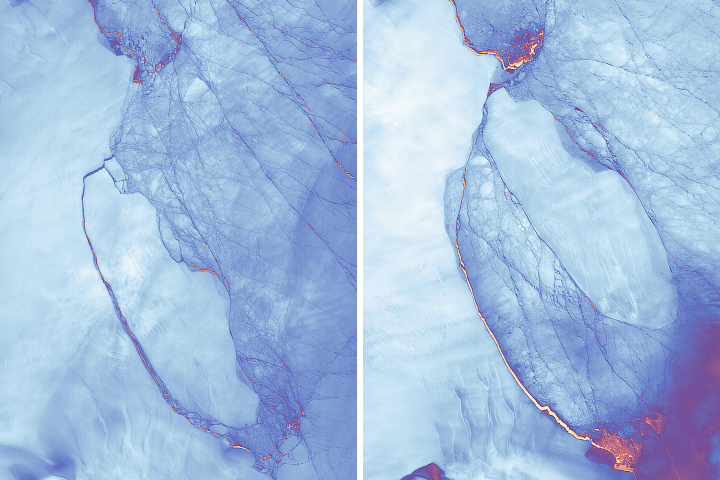 A few flights during the 2017 campaign took scientists and instruments over the newly reshaped Larsen C ice shelf. 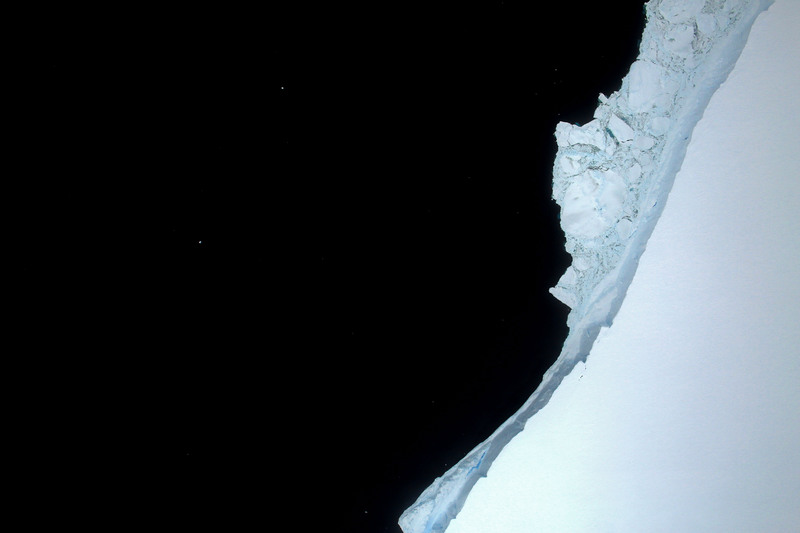 The iceberg from Larsen C, named A-68A, was photographed during a flight on November 12, 2017. 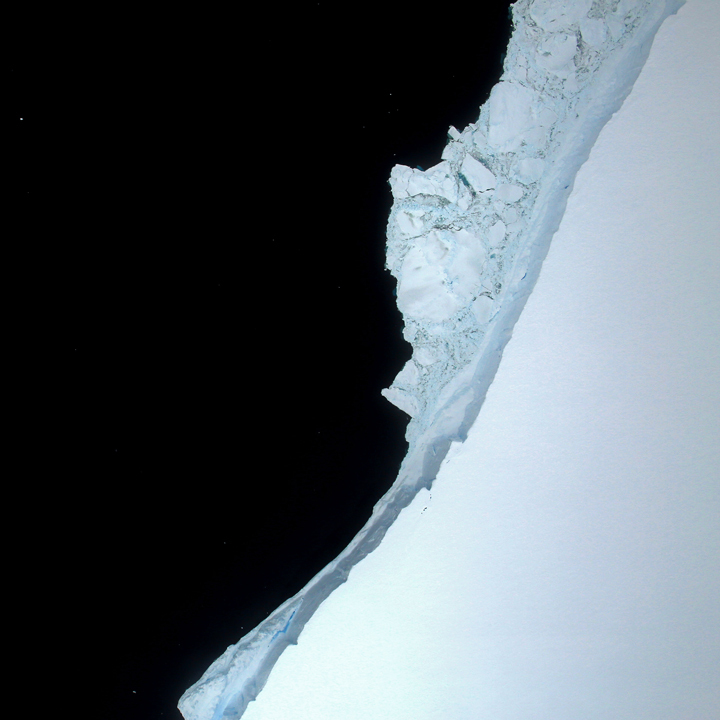 John Sonntag, IceBridge mission scientist, shot the photo from a window of the P-3 research plane. 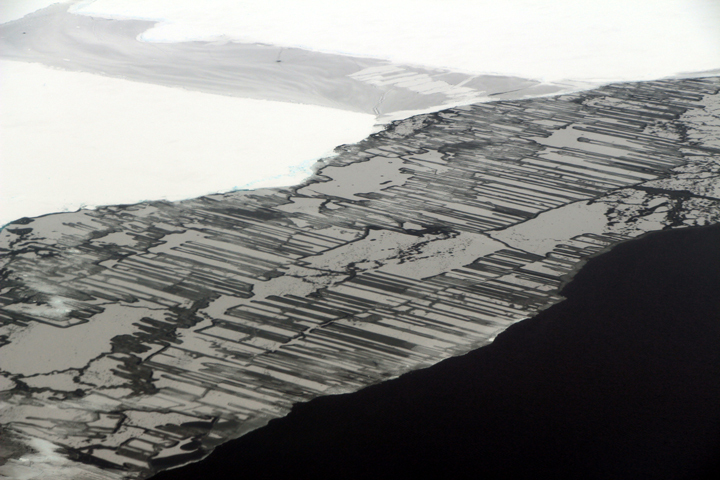 The flight aimed to get a better understanding the Larsen system as a whole, and scientists made gravity measurements to “see” the shape of the seafloor and bedrock below the ice. Read more in this blog post. 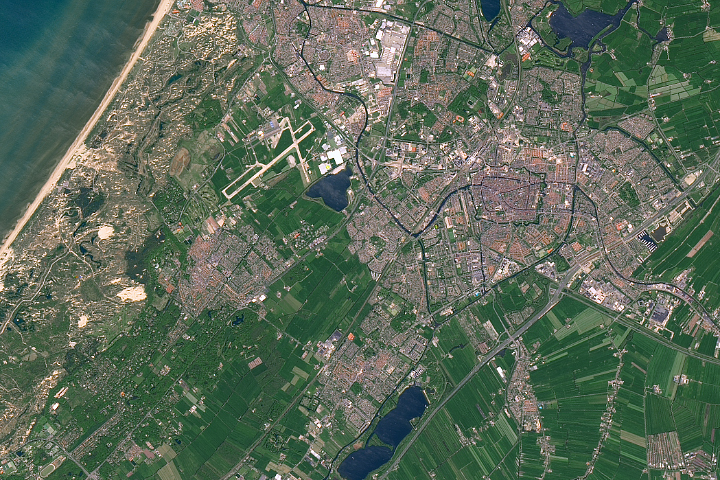 The second image is a photograph acquired by the Digital Mapping System (DMS) during the same flight. The DMS is essentially a downward-looking digital camera pointed out a window on the belly of the aircraft. 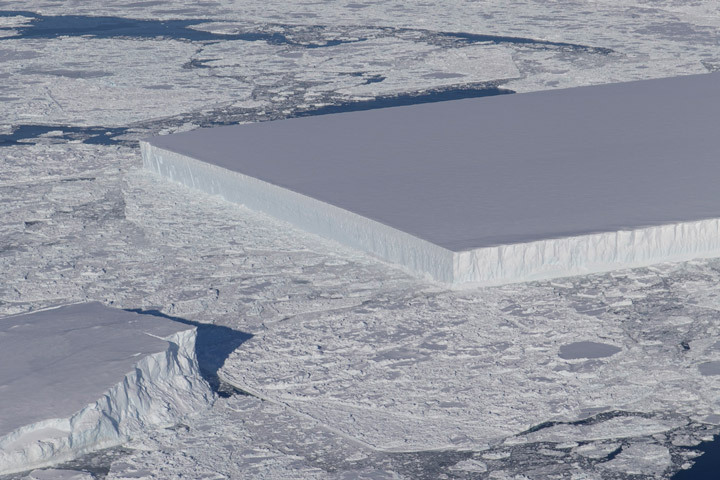 This image shows part of the giant iceberg’s edge (the side closest to the shelf) and open water. 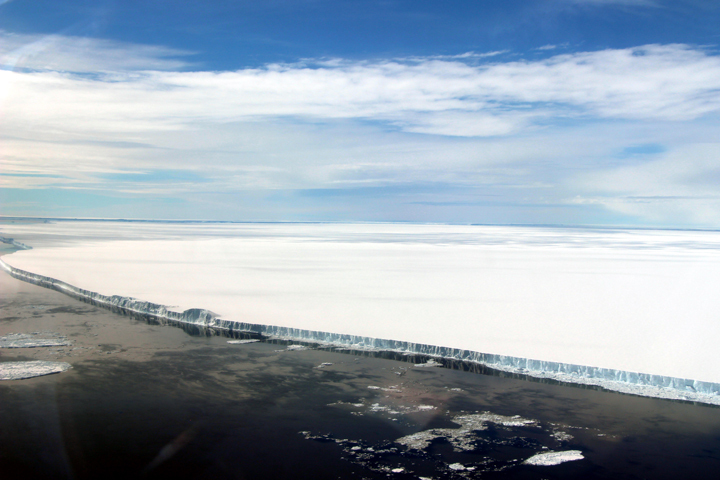 Estimates indicate that the edges of the shelf and iceberg tower about 30 meters above the surface of the sea. 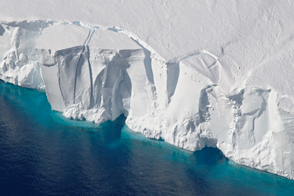 Some mélange appears attached to the iceberg, and blocks of ice have fallen away giving the berg’s edge giving it an angular appearance. NASA photographs courtesy of NASA/John Sonntag (top) and IceBridge Digital Mapping System (bottom). Story by Kathryn Hansen. 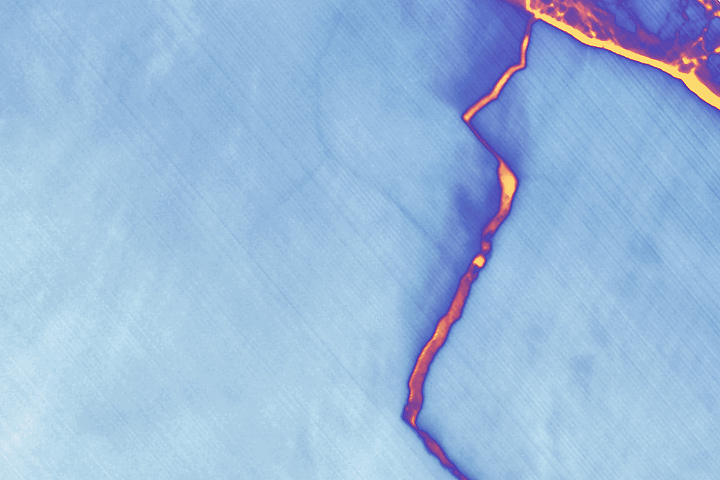 From an altitude of just over 1,000 feet, photographs from aircraft give an uncommon look at the massive Antarctic iceberg.